The King of Jerusalem was the supreme ruler of the Kingdom of Jerusalem, the Crusader state founded by Christian princes in 1099 when the First Crusade took the city. Godfrey of Bouillon, the first ruler of the Kingdom of Jerusalem, himself refused the title of king, and instead chose the title "Defender of the Holy Sepulchre". Thus, the title of king was only introduced for his successor, King Baldwin I in 1100. The city of Jerusalem was lost in 1187, but the Kingdom of Jerusalem survived, moving its capital to Acre in 1191. The city of Jerusalem was re-captured in the Sixth Crusade, during 1229–39 and 1241–44. The Kingdom of Jerusalem was finally dissolved with the fall of Acre and the end of the Crusades in the Holy Land in 1291. After the Crusader States ceased to exist, the title of King of Jerusalem was claimed by a number of European noble houses descended from the kings of Cyprus or the kings of Naples. The (purely ceremonial) title of King of Jerusalem is currently used by Felipe VI of Spain. It was claimed by Otto von Habsburg as Habsburg pretender, and by the kings of Italy until 1946. The Kingdom of Jerusalem had its origins in the First Crusade, when Godfrey of Bouillon, after refusing a crown and the title of King "upon the plea that he would never wear a crown of gold where his Saviour had worn a crown of thorns", took the title Advocatus Sancti Sepulchri (Protector of the Holy Sepulcher) in 1099 and was inaugurated as ruler of Jerusalem in the Church of the Nativity in Bethlehem. The following year, his brother Baldwin I was the first to use the title king and the first to be crowned king in the Church of the Holy Sepulchre in Jerusalem itself. The kingship of Jerusalem was partially elected and partially hereditary. During the height of the kingdom in the mid-12th century there was a royal family and a relatively clear line of succession. Nevertheless, the king was elected, or at least recognized, by the Haute Cour. Here the king was considered a primus inter pares (first among equals), and in his absence his duties were performed by his seneschal. The purpose-built royal palace used from the 1160s onwards was located south of Jerusalem's citadel. The Kingdom of Jerusalem introduced French feudal structures to the Levant. The king personally held several fiefs incorporated into the royal domain, that varied from king to king. He was also responsible for leading the kingdom into battle, although this duty could be passed to a constable. While several contemporary European states were moving towards centralized monarchies, the king of Jerusalem was continually losing power to the strongest of his barons. This was partially due to the young age of many of the kings, and the frequency of regents from the ranks of the nobles. After the fall of Jerusalem in 1187, the capital of the kingdom was moved to Acre, where it remained until 1291, although coronations took place in Tyre. In this period the kingship was often simply a nominal position, held by a European ruler who never actually lived in Acre. When young Conrad III was king and living in Southern Germany, his father's second cousin, Hugh of Brienne, claimed the regency of the Kingdom of Jerusalem and, indirectly, his place in the succession. The claim was made in 1264 as senior descendant and rightful heir of Alice of Champagne, second daughter of Queen Isabella I, Hugh being the son of their eldest daughter. But was passed over by the Haute Cour in favour of his cousin, Hugh of Antioch, the future Hugh III of Cyprus and Hugh I of Jerusalem. After Conrad III's execution by Charles I of Sicily in 1268, the kingship was held by the Lusignan family, who were simultaneously kings of Cyprus. However, Charles I of Sicily purchased the rights of one of the heirs of the kingdom in 1277. In that year, he sent Roger of Sanseverino to the East as his bailiff. Roger captured Acre and obtained a forced homage from the barons. Roger was recalled in 1282 due to the Sicilian Vespers and left Odo Poilechien in his place to rule. His resources and authority was minimal, and he was ejected by Henry II of Cyprus when he arrived from Cyprus for his coronation as King of Jerusalem. Acre was captured by the Mamluks in 1291, eliminating the crusader presence on the mainland. In 1127 Fulk V, Count of Anjou received an embassy from King Baldwin II of Jerusalem. Baldwin II had no male heirs but had already designated his daughter Melisende to succeed him. Baldwin II wanted to safeguard his daughter's inheritance by marrying her to a powerful lord. Fulk was a wealthy crusader and experienced military commander, and a widower. His experience in the field would prove invaluable in a frontier state always in the grip of war. However, Fulk held out for better terms than mere consort of the Queen; he wanted to be king alongside Melisende. Baldwin II, reflecting on Fulk's fortune and military exploits, acquiesced. Fulk then resigned his titles to Geoffrey and sailed to become King of Jerusalem, where he married Melisende on 2 June 1129. Later Baldwin II bolstered Melisende's position in the kingdom by making her sole guardian of her son by Fulk, Baldwin III, born in 1130. Fulk and Melisende became joint rulers of Jerusalem in 1131 with Baldwin II's death. From the start Fulk assumed sole control of the government, excluding Melisende altogether. He favored fellow countrymen from Anjou to the native nobility. The other crusader states to the north feared that Fulk would attempt to impose the suzerainty of Jerusalem over them, as Baldwin II had done; but as Fulk was far less powerful than his deceased father-in-law, the northern states rejected his authority. The death of Fulk, as depicted in MS of William of Tyre'sHistoria andOld French Continuation, painted in Acre, 13C. Bib. Nat. Française. In Jerusalem as well, Fulk was resented by the second generation of Jerusalem Christians who had grown up there since the First Crusade. These "natives" focused on Melisende's cousin, the popular Hugh II of Le Puiset, count of Jaffa, who was devotedly loyal to the Queen. Fulk saw Hugh as a rival, and in 1134, in order to expose Hugh, accused him of infidelity with Melisende. Hugh rebelled in protest and secured himself to Jaffa, allying himself with the Muslims of Ascalon. He was able to defeat the army set against him by Fulk, but this situation could not hold. The Patriarch interceded in the conflict, perhaps at the behest of Melisende. Fulk agreed to peace and Hugh was exiled from the kingdom for three years, a lenient sentence. However, an assassination attempt was made against Hugh. Fulk, or his supporters, were commonly believed responsible, though direct proof never surfaced. The scandal was all that was needed for the queen's party to take over the government in what amounted to a palace coup. Author and historian Bernard Hamilton wrote that the Fulk's supporters "went in terror of their lives" in the palace. Contemporary author and historian William of Tyre wrote of Fulk "he never attempted to take the initiative, even in trivial matters, without (Melisende's) consent". The result was that Melisende held direct and unquestioned control over the government from 1136 onwards. Sometime before 1136 Fulk reconciled with his wife, and a second son, Amalric was born. In 1143, while the king and queen were on holiday in Acre, Fulk was killed in a hunting accident. 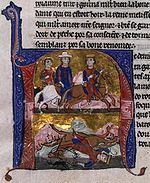 His horse stumbled, fell, and Fulk's skull was crushed by the saddle, "and his brains gushed forth from both ears and nostrils", as William of Tyre describes. He was carried back to Acre, where he lay unconscious for three days before he died. He was buried in the Church of the Holy Sepulchre in Jerusalem. Though their marriage started in conflict, Melisende mourned for him privately as well as publicly. Fulk was survived by his son Geoffrey of Anjou by his first wife, and Baldwin III and Amalric I by Melisende. Baldwin III ascended the throne with his mother as co-ruler, in 1143. His early reign was laced with squabbles with his mother over the possession of Jerusalem, till 1153, when he took personal hold of the government. He died in 1163, without heirs, and the kingdom passed to his brother, Amalric I, although there was some opposition among the nobility to Amalric's wife Agnes; they were willing to accept the marriage in 1157 when Baldwin III was still capable of siring an heir, but now the Haute Cour refused to endorse Amalric as king unless his marriage to Agnes was annulled. The hostility to Agnes, it must be admitted, may be exaggerated by the chronicler William of Tyre, whom she prevented from becoming Latin Patriarch of Jerusalem decades later, as well as from William's continuators like Ernoul, who hints at a slight on her moral character: "car telle n'est que roine doie iestre di si haute cite comme de Jherusalem" ("there should not be such a queen for so holy a city as Jerusalem"). Nevertheless, consanguinity was enough for the opposition. Amalric agreed and ascended the throne without a wife, although Agnes continued to hold the title Countess of Jaffa and Ascalon and received a pension from that fief's income. The church ruled that Amalric and Agnes' children were legitimate and preserved their place in the order of succession. Through her children Agnes would exert much influence in Jerusalem for almost 20 years. Almaric was succeeded by his son by Agnes, Baldwin IV. Almaric's wives, Agnes of Courtenay, now married to Reginald of Sidon, and Maria Comnena, the dowager Queen, who had married Balian of Ibelin in 1177. His daughter by Agnes, Sibylla, was already of age, the mother of a son, and was clearly in a strong position to succeed her brother, but Maria's daughter Isabella had the support of her stepfather's family, the Ibelins. 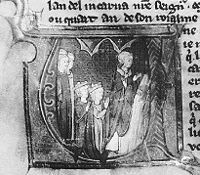 In 1179, Baldwin began planning to marry Sibylla to Hugh III of Burgundy, but by spring 1180 this was still unresolved. Raymond III of Tripoli attempted a coup, and began to march on Jerusalem with Bohemund III, to force the king to marry his sister to a local candidate of his own choosing, probably Baldwin of Ibelin, Balian's older brother. To counter this, the king hastily arranged her marriage to Guy of Lusignan, younger brother of Amalric, the constable of the kingdom. A foreign match was essential to bring the possibility of external military aid to the kingdom. With the new French king Philip II a minor, Guy's status as a vassal of the King and Sibylla's first cousin Henry II of England – who owed the Pope a penitential pilgrimage – was useful. By 1182, Baldwin IV, increasingly incapacitated by his leprosy, named Guy as bailli. Raymond contested this, but when Guy fell out of favour with Baldwin the following year, he was re-appointed bailli and was given possession of Beirut. Baldwin came to an agreement with Raymond and the Haute Cour to make Baldwin of Montferrat, Sibylla's son by her first marriage, his heir, before Sibylla and Guy. The child was crowned co-king as Baldwin V in 1183 in a ceremony presided by Raymond. It was agreed that, should the boy die during his minority, the regency would pass to "the most rightful heirs" until his kinsmen – the Kings of England and France and Frederick I, Holy Roman Emperor – and the Pope were able to adjudicate between the claims of Sibylla and Isabella. These "most rightful heirs" were not named. Baldwin IV died in spring 1185, and was succeeded by his nephew. Raymond was bailli, but he had passed Baldwin V's personal guardianship to Joscelin III of Edessa, his maternal great-uncle, claiming that he did not wish to attract suspicion if the child, who does not seem to have been robust, were to die. Baldwin V died during the summer of 1186, at Acre. Neither side paid any heed to Baldwin IV's will. After the funeral, Joscelin had Sibylla named as her brother's successor, although she had to agree to divorce Guy, just as her father had divorced her mother, with the guarantee that she would be allowed to choose a new consort. Once crowned, she immediately crowned Guy. Meanwhile, Raymond had gone to Nablus, home of Balian and Maria, and summoned all those nobles loyal to Princess Isabella and the Ibelins. Raymond wanted instead to have her and her husband Humphrey IV of Toron crowned. However, Humphrey, whose stepfather Raynald of Châtillon was an ally of Guy, deserted him and swore allegiance to Guy and Sibylla. The frequent absence or minority of monarchs required regents to be appointed many times throughout the Kingdom's existence. Count Hugh of Brienne claimed the regency of the Kingdom of Jerusalem, and indirectly, his place in the succession in 1264 as senior heir of Alice of Jerusalem, second daughter of Queen Isabella I, and Hugh I of Cyprus. Hugh, although the son of their eldest daughter, was passed over by the Haute Cour in favour of his cousin Hugh of Antioch, the future Hugh III of Cyprus and Hugh I of Jerusalem. The Brienne claim to the Kingdom of Jerusalem continued, but the family had afterwards next to no part in affairs in Outremer. After the end of the kingdom, Henry II of Cyprus continued to use the title of King of Jerusalem. After his death the title was claimed by his successors, the kings of Cyprus. The title was also continuously used by the Angevin kings of Naples, whose founder, Charles of Anjou, had in 1277 bought a claim to the throne from Mary of Antioch. Thereafter, this claim to the Kingdom of Jerusalem was treated as a tributary of the crown of Naples, which often changed hands by testament or conquest rather than direct inheritance. As Naples was a papal fief, the Popes often endorsed the title of King of Jerusalem as well as of Naples, and the history of these claims is that of the Neapolitan Kingdom. The House of Lorraine inherited the claim from the Angevin kings through Rene II, son of Louis II of Naples and pretender to the Neapolitan throne. After the merger of the House of Lorraine with the Hapsburgs with the marriage of Francis I Stephen to Maria Theresa of Austria, the claim was inherited by the Hapsburgs and featured among the titles of the Emperors of Austria until 1918. There are several potential[clarification needed] claimants of the title today. Louis Alphonse, Duke of Anjou represents a senior Bourbon line whose renunciations of their Spanish rights did not mention the claim to Jerusalem. Karl von Habsburg, current head of the House of Habsburg-Lorraine; Karl's late father Otto von Habsburg renounced all pretense to the Habsburg titles in 1958. Italics indicate individuals who did not themselves use the title of king of Jerusalem. Charlotte I 1458–1485 (d. 1487) m. 1459 her cousin Louis of Savoy (d. 1482). In 1460, Charlotte was dispossessed of Cyprus by her illegitimate half-brother James. However, she maintained her claims until 1485, when she resigned them to the next legitimate heir, her 1st cousin once removed Charles I of Savoy (son of her first cousin Amadeus IX of Savoy). Catherine surrendered her rights to the Republic of Venice in 1489. On the death of Charles II of Savoy, the Duchy of Savoy passed to his grand uncle and heir-male Philip (brother of Amadeus IX of Savoy). Although Charles II's sister Yolande Louise of Savoy did not succeed in Savoy because of her gender, she was the heir general of his brother and as such might be regarded to have succeeded him in claims to Cyprus and Jerusalem. The Dukes of Savoy continued to claim Jerusalem. However, to avoid conflicts with claims of the major European houses as the Habsburg and Bourbons, the Savoyard claim appears hidden in the list of titles with the elliptical "&c."
Louis III de La Trémoille (died 1577). His issue succeeded to the Cypriot claims to the title of King of Jerusalem when his father died. As descendants of Frederick IV of Naples, they also claimed Naples (and Jerusalem) and they also succeeded to the Brienne claims to Kingdom of Jerusalem of his distant cousin John Casimir of Poland at the latter's death 1672, uniting the successions of Brienne and of Cyprus to the de jure crown of Jerusalem. Mary of Antioch claimed the throne of Jerusalem from 1269 to 1277. She was the daughter of Prince Bohemond IV of Antioch and his second wife Melisende of Cyprus. Melisende was the youngest daughter of Isabella, Queen of Jerusalem and her fourth husband, Amalric II of Jerusalem, king of Cyprus. Since Mary was, at the time of the death of Conrad III (Conradin), the only living grandchild of queen Isabella, she claimed the throne on basis of proximity in blood to the kings of Jerusalem. Denied by the Haute Cour, she went to Rome and sold her rights, with papal blessing and confirmation, to Charles of Anjou in 1277. Thereafter, this claim to the kingdom of Jerusalem was treated also as tributary to the crown of Naples, which often changed hands by testament or conquest rather than direct inheritance. Joan I of Naples 1343–1382. Joan left her kingdom by testament to Louis I of Anjou, whom she had previously adopted as heir, but she was ousted and soon murdered by Charles of Durazzo, the heir male of her house. Joan II of Naples 1414–1435 Joan left her kingdom by testament to René of Anjou, of the junior line. She had previously adopted (and subsequently repudiated the adoption) her kinsman Alfonso V of Aragon and Sicily, who launched a conquest to have Naples. René I 1434–1480. René I united the claims of junior and senior lines. However, in 1441, control of the Kingdom of Naples was lost to Alfonso V of Aragon, who also claimed the kingdom of Jerusalem thereby. While René was succeeded in Bar by his grandson René of Vaudemont, René's nephew and heir male Charles IV of Anjou claimed the kingdoms of Sicily and Jerusalem, and he then testamented them to his cousin Louis XI of France. René II 1480–1508, He did not adopt the title until 1493. Charles V 1483–1498 — In 1494 Charles VIII of France claimed the Kingdom of Naples and Jerusalem as the great-grandson of Louis II of Anjou and launched his conquest. In 1495, he had conquered Naples and was crowned as king. Louis V 1498–1515. He took up the claim, although he lacked close descent from the main Neapolitan lines (he was a descendant of the eldest daughter of Charles II of Naples). He succeeded in conquering part of Naples 1500–1504. No other French king has adopted the title. .
Ferdinand II 1495–1496, who lost briefly to Charles VIII of France. Frederick 1496–1501, uncle, during whose reign the Neapolitan lands were invaded by the alliance of Louis XII of France, who claimed the succession, and Ferdinand II of Aragon, who succeeded in driving out both Frederick and Louis by 1504. Philip V 1700–1724 (by testament), during whose reign the Kingdom of Naples was lost in 1707 to Spanish claimant king Charles III and 1713 the island of Sicily (later that of Sardinia) to Victor Amadeus II of Savoy who also was given the title King of Jerusalem (see above the Savoyard succession); Philip nonetheless continued to use the Two Sicilies and Jerusalem titles, which were thereafter used by all subsequent Bourbon kings of Spain. Charles VI 1702–1740, who claimed the Spanish possessions in opposition to Philip V; he renounced lost the Kingdom of Naples in 1734 to a Bourbon prince, the future Charles III of Spain, and renounced his claims, retaining his titles to Naples and Jerusalem during his lifetime. Hugh of Brienne and his heirs represent the senior heirs-general to the Kingdom, although they never pressed the claim after Hugh's rejection by the Haute Cour. In 1672, the succession of Brienne and of Cyprus to the crown of Jerusalem united. Frederick of Meissen, Landgrave of Thuringia, briefly used the title after the death of Conradin in 1268, as grandson of Frederick II, who had crowned himself King of Jerusalem in his own right. This claim was never recognized in Outremer or elsewhere. ^ a b Whitworth Porter (2013). A History of the Knights of Malta. Cambridge Library Collection - European History. Cambridge University Press. p. 18. ISBN 9781108066228. Retrieved 20 May 2014. Refusing the title of King and the diadem which were offered him, upon the plea that he would never wear a crown of gold where his Saviour had worn a crown of thorns, he modestly contented him with the title of Defender and Advocate of the Holy Sepulchre. ^ Catalogue of additions to the manuscripts - British Museum. Dept. of Manuscripts - Google Libros. Books.google.es. Retrieved 27 November 2012. ^ The ... history of the feats, gests, and prowesses of the chevalier Bayard ... - Jacques de Mailles - Google Libros. Books.google.es. Retrieved 27 November 2012.